This novel was an impulse grab off of a display shelf at the library. Something about the flying man in a brightly colored silk shirt captured my interest. Then, reading about Ararat, a city that changes and flows in accordance to the whims of the multitude of "gods" (which seem more like fundamental forces, perhaps unthinking natural phenomena that nevertheless catch people up and change lives on a daily basis), I was hooked. While I found the beginning to be a little slow, my interest picked up once I learned who the main characters were and understood a little more about the environment they find themselves in. First there is Arjun, a foreigner from far off Gad. He is a composer and a follower of the Voice, a god which mysteriously disappeared. Left bereft by the absence of the Voice, he hears of Ararat and it's plenitude of deities, and decides that if their god could have gone anywhere, that was probably the most likely place to begin searching. So he sets off in search of his lost god. During his arrival to the city, the elusive Thunderbird makes a visitation to the skies above Ararat. Its powers cause "flocks" (haha) of people to throw themselves into the air to fly after it, borrowing its powers for a short while. One youth, Jack, a laborer in a silk factory, uses the opportunity to fly to freedom. He finds his powers growing, while others' are merely fleeting, and he becomes a Peter Pan-esque thief and gangleader of street children, and freer of bondsmen and prisoners of the city. Another big event as a result of the bird god's passage is the raising of the Thunderer, a warship fitted with a large balloon, into the skies above the city to become a weapon in the hands of the Countess Ilona. Some of the other notable gods in the city include Tiber, a pillar of perpetual flame that has many followers. There is the Typhon - I don't want to spoil it too much, but this river god is one messed up, sickening, malevolent force. But it adds an incredible amount of horror and fascination to the story. And there is the Spider - a pretty minor player but a very provocative concept - believers give and receive envelopes at random. Upon opening an envelope, they are instructed to perform one deed (good or bad), which they must complete, then write new instructions and seal it and it goes to someone else. An inkeeper, Defour, explains how the Spider has impacted her life, an interesting minor tale within the larger one. There is the scholar Holbach and his quest to map out the city, and the mysterious individuals of Shay and Lemuel, who have mysterious devices and knowledge and have a large but behind-the-scenes effect on everything going on. Also interesting are the Countess Ilona with her enemies and her soldiers, and the running-amock Ararat with its teeming poverty and crime. All in all, a lesson on the darker side of humanity and the struggles of the poverty-stricken in the slums. 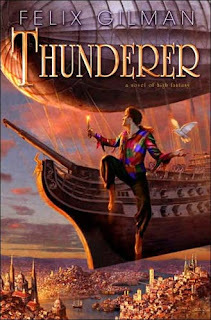 Thunderer came fresh off the presses in January 2008, and is Felix Gilman's first novel. It was a great first effort, and I will be interested to see where he goes from here.